I have written many times about COE (coefficient of expansion) and how never to mix COEs. But what about art glass.. Can you fuse that? Yes you can! It is not like tested glass where everything that is 96 COE can be fused together. You cannot fuse one piece of art glass to another piece of art glass. Well, what the heck can you do with it? 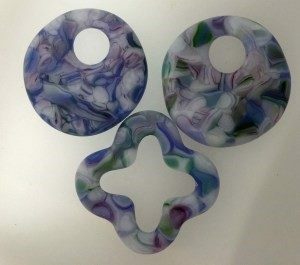 You can take two pieces of art glass from the same sheet and fuse them together! I saw a project where a person took baroque glass.. Two pieces. Stacked them on top of one another in different directions and made plates. They were beautiful! I don’t have a picture of the plates.. but imagine two pieces of this blue baroque full fused and then slumped! You could also make a slumped vase, or a bowl. Another idea is to smash it up and use it in casting molds. This picture is from Elegant Fused Glass by Karen. The difficulty is you will have to figure out your firing schedule. You may have to coat it with Spray A to reduce devit. This entry was posted in Events on January 19, 2019 by admin.